This weekend tens of thousands of barbeque lovers from around the world will gather at Tom Lee Park on the banks of the majestic Mississippi in downtown Memphis for the Memphis in May World Championship Barbeque Contest. There are many barbeque competitions throughout America, but clearly the granddaddy of them all, or in this case, the big hog, is the Memphis in May World Championship. But we Legal Loins retired years ago, hanging up our aprons, and turning over the competition to a new generation. Mason is famous for two of the world’s finest restaurants: Gus’ Fried Chicken and Bozo’s Bar-B-Q. Both are worth a cholesterol-raising trip to Mason. And Bozo’s is not only famous for the world’s best barbeque. It will live in American legal history because it once got in a fight with a clown, and the battle went all the way to the United States Supreme Court. 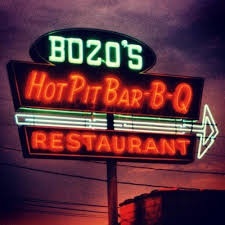 Bozo’s Bar-B-Q has been around since 1923, founded by a man with the wonderful name of Thomas Jefferson “Bozo” Williams. But there was another Bozo in Chicago, and he was a clown. Literally. He was Larry Harmon, famously known as Bozo the Clown, star of the “Bozo the Clown TV Show,” telecast nationally for years by WGN in Chicago. For decades Bozo the Clown and Bozo the restaurant co-existed in harmony in their separate domains of hilarity and pork. But in 1982, Helen Williams, the daughter of Thomas Jefferson “Bozo” Williams, moved to register the trademark “Bozo’s” for the restaurant. Word of this apparently got to Chicago, and when Bozo (the clown, not the restaurant) heard about it, he was not amused. He called his lawyers, who opposed the restaurant’s pursuit of the trademark. Lengthy litigation ensued, and no, I cannot resist making the comment that this was not the first case in which a clown had appeared in court. But it definitely was the first time a clown was opposed by a pig. Lawyers for Bozo the Clown argued that because they are enforced nationally, federal trademarks should be awarded only to businesses engaged in significant interstate commerce. They condescendingly referred to Bozo the restaurant as a “little mom and pop business,” and contended that to allow such a small barbeque restaurant to register a trademark for the whole country was a “prescription for paralysis.” Actually, it was a prescription for pork. Believe it or not, the case went all the way to the United States Supreme Court where justice prevailed, for Bozo’s the restaurant, rather than Bozo the Clown. It was a classic case of pigs getting fat and clowns getting slaughtered. And so if you are in Memphis this weekend, go out to Tom Lee Park to see teams such as “Contempt of Pork” take on the “Love Me Tenderloins,” “Sweet Swine O’ Mine,” and “Notorious P.I.G.” for the World Championship. And when you’re driving along I-40 and come to Exit 35, take the exit and drive just a few miles on Highway 70 to Mason where you can enjoy the world’s greatest barbeque from Bozo … the restaurant, not the clown. Custom Essay Writing UK: It is an inclination for me to read this well-researched post about barbeque competitions because I love barbeque grill party along with friends. hay day cheats online: This video game is a freemium mobile farming simulator that you download and install absolutely free yet later on some things could be acquired genuine loan. research paper assistance: We are all should follow the pigs got fat and clowns articles for the bills. Everything needed to update best stories and bills blog. That's why? we are interested on this blog updated news reviews.